Les Apprentis du Temps is a watchmaking experience for visitors to the Swiss Jura. They arrange a hands-on workshop with Swiss watchmakers, teaching the guests about the trade through the assembly of their own watch. Before I arrived, I was able to select the components I would use (case, dial, hands) in my workshop. These components come from local suppliers, reflecting the tradition of “etablissage” or assembly of watches that began in Le Locle over two hundred years ago. The resulting watch very much resembles the so-called “marriage” watches which combine a classic pocket watch movement (and sometimes dial, hands, and case) into an oversized wristwatch. This is to be expected, since my watch uses the ETA 6498 movement which is identical to the classic Unitas movements of yore. This is the reason for my case, dial, and hands selections: I wanted to stay true to the pocket watch style of the 19th century. This is easily the largest watch I own, measuring 45 mm in diameter. But the rounded edges and curved lugs help wearability, as does the fairly thin 10.4 mm profile. Still, the 22 mm strap is massive. Sadly, I was not able to finish or detail the movement so there’s not much to see inside the sapphire case back. But it’s still nice to be able to see the large balance wheel slowly ticking away inside. I find myself reaching for this watch fairly often, though it’s not the most enjoyable one to wear. And it always gets a comment or complement – perhaps the large size is hard to ignore. 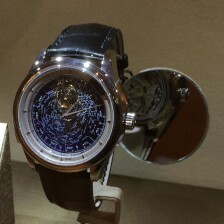 This watch is special to me as well, recalling a unique watchmaking adventure!